If England’s squad were a single footballer and you compared his goal-scoring record for the 2015-16 season with his Euro 2016 rivals in a Golden Shoe-style contest, then he would be starting the tournament as the continent’s hottest striker. England would be top of the table ahead of Germany in second place, then Russia, Italy and France. Propping up the table, from 24th place upwards, would be Albania, Northern Ireland, Switzerland, the Republic of Ireland and Iceland. That’s the conclusion of a Sportingintelligence analysis of every goal scored in domestic league competitions last season by every single player appearing at Euro 2016, then weighted appropriately for the significance of the leagues those goals were scored in. The analysis considers the records of the 480 outfield players, with the 72 non-scoring goalkeepers excluded. England’s 20 relevant players scored 114 goals last season in league games, led by Harry Kane’s 25 goals in 38 league games for Tottenham, then Jamie Vardy’s 24 goals in 36 games as Leicester won the Premier League. Dele Alli scored 10 for Tottenham in the league, and Wayne Rooney, Daniel Sturridge and Ross Barkley scored eight each for Manchester United, Liverpool and Everton respectively. Raheem Sterling (6), James Milner (5) and Marcus Rashford (5) all chipped in with a handful or more, with Adam Lallana netting four, Eric Dier three, Gary Cahill and Jordan Henderson two each, as Bertrand, Clyne, Rose and Walker got one apiece. The only other Euro 2016 squad collectively that topped that in absolute terms was Romania, who scored 120 goals. But all goals are not equal, as we all know. Just as Europe’s Golden Shoe award (formally the Golden Boot) uses weighted numbers to reflect the ‘calibre’ of goals scored, so we have applied weightings using the same criteria, namely two points per goal scored in one of Europe’s top five divisions (by UEFA co-efficient for 2015-16), and 1.5 points for each goal in the next tier of divisions (those with 7+ coefficient points), then 1 point for the next level; and finally 0.5 points per goal anywhere else. 2pts per goal: goals scored in Premier League (ENG), Serie A (ITA), La Liga Primera Division (SPA), Bundesliga (GER) and Premier League (RUS); 1.5pts per goal: goals scored in top divisions in FRA, BEL, CZR, NOR, POR, UKR; 1pt per goal: top divisions in AUT, BUL, CRO, DEN, GRE, HUN, MEX, USA, NETH, POL, ROM, SCO, SUI, SWE, TUR plus second tiers in ENG, GER, SPA; 0.5pts per goal: goals scored in ALB, AUS, AZER, CHN, CYP, KAZ, QAT, SAUDI and in third and fourth tiers in England. On this basis, Zlatan Ibrahimovic’s 38 league goals for PSG in Ligue 1 are worth 57 points to Sweden’s total (at 1.5pts per goal), and Cristiano Ronaldo’s 35 league goals for Real Madrid are worth 70 points for Portugal (at 2pts per goal). Gareth Bale’s 19 league goals in La Liga this season earn 38 points for Wales side but international team-mate Sam Vokes’ 15 goals in the Championship earn them only 15 points. England’s 1966 World Cup final hat-trick hero Geoff Hurst (the only man to score a treble in a World Cup final) has claimed that England have the most exciting squad since 1966. Certainly they have attacking flair and hard numbers to prove it. With all of the England squad’s goals coming in the English Premier League, using our weighted index they come out on top with a total of 228 points. Germany come second with 201 points, and France scored the next most points, 196, with a lot of thanks due to Antoine Griezmann (22 goals in 38 for Atletico Madrid) and Olivier Giroud (16 in 38 for Arsenal). The Republic of Ireland with 107 points (Shane Long, 10 in 28 for Southampton) lie 15th out of the 24 nations ahead of Wales in 18th (Gareth Bale 19 in 23 for Real Madrid) and Northern Ireland 23rd (Will Grigg 25 in 40 for Wigan). On the eve of big tournaments, we often hear that English players play more matches than any other country so is this why they appear to have a healthy lead in the total weighted goals chart? We decided to investigate this (it’s not true) and then apply our findings to create a goals scored per 100 games played, shown in our second chart, below. Actually England’s 20 outfield players played ‘only’ 557 league games between then in 2015-16, or fewer than the players from France (604), Italy (571), Portugal (580), Belgium (590) and Spain (607) to name just five. See the top graphic for all games for all countries. 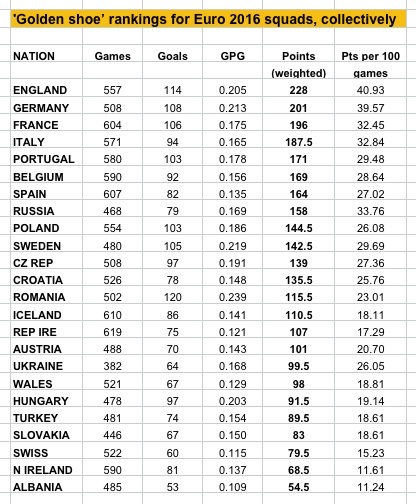 However, even though England collectively played fewer games than any major competitor bar Germany (508), England still managed more goals in absolute terms than anyone but Romania, so of course they also came out on top of the number of weighted goals per 100 games. Whichever way the data is interpreted, England are starting the tournament with the scoring power to trouble the best of Europe’s defenders. Whether England’s defenders can keep at bay Europe’s best attackers … well that’s an entirely different question. Andy Carpenter, football fan, statistician and England aficionado, is owner of Crowd Control Solutions, who sell crowd control barriers and pedestrian barrier covers. He cannot, however, control how many goals England will actually score at Euro 2016.